XXXIV, 196 p., 14,3 x 22,4 cm. Against the backdrop of the contemporary debate on faith and knowledge, Eschenmayer (1768–1852) established his own concept which allocates an important function to the absolute and to reason and nevertheless (unlike Schelling and Hegel) shows their limitations. Nature and history are presented as realms of the reasonable system, whereas the organism performs a mediatory function which shows the distinct features of the individual and the I-Thou relationship. 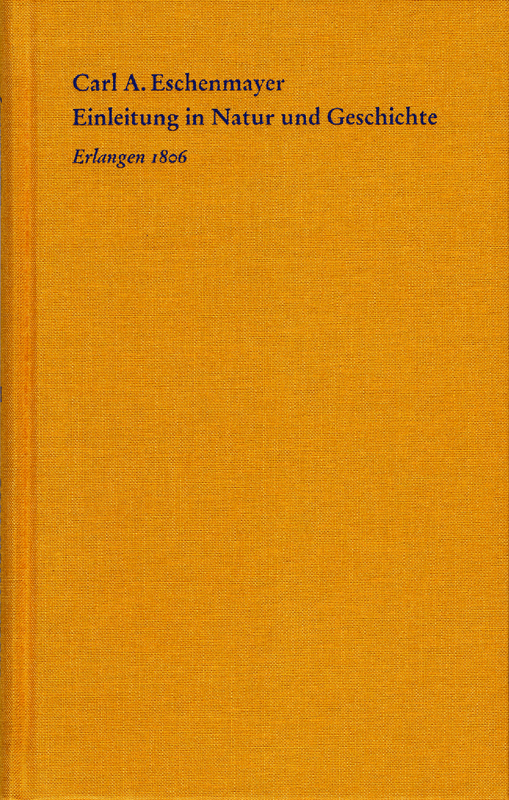 This is the author’s way of dealing as well with the prevailing views of this era on natural philosophy and science and the humanities, as is illustrated explicitly in the additional material contained in this volume (including his article ›Deduktion des lebenden Organismus‹ (Deduction of the Living Organism) and two letters to Oken, a critic.